Say this for Black Earth Rising—it doesn’t lack for ambition or directorial flair. The drama is the latest political thriller from Hugo Blick, who told a similarly sprawling, female-centered story in 2014’s The Honorable Woman. 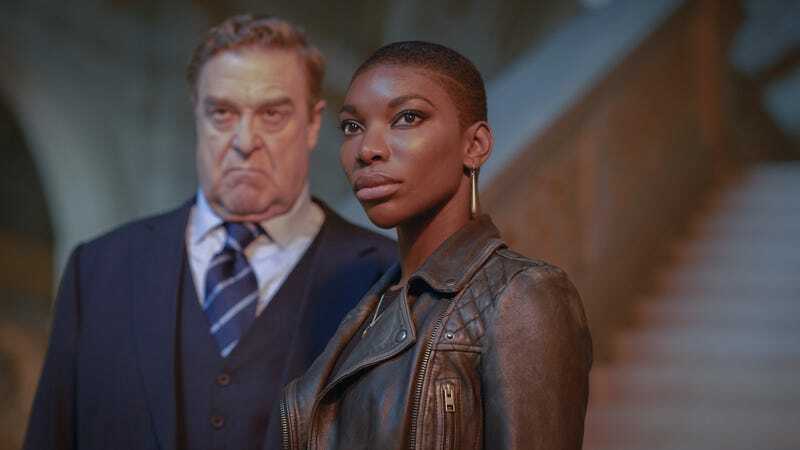 Starring Chewing Gum creator Michaela Coel, Black Earth Rising traverses several nations in Europe and Africa to shed light on the lasting effects of imperialism, opening up a matryoshka doll’s worth of conspiracies along the way. Once again, Blick is the sole helmer and writer for the series, but proves he’s really only up to the task of the former, pairing exhilarating chases through London and the Democratic Republic Of The Congo with more meditative shots of the coldly extravagant homes of global high rollers. His treatment of the atrocities that the series explores is respectful and inspired, taking us back to one of the darkest times in Rwanda’s history via black-and-white animation. But Blick doesn’t have the same acumen for the more personal journey that unfolds in Black Earth Rising, and in the process, short shrifts his protagonist. As clumsy as it often is, though, Blick’s script isn’t distancing itself from the Hutu-led massacres, or the undue influence Western nations continue to exert in the still-recovering region, or the destabilization of the nearby DRC. There’s very little wrongdoing that Black Earth Rising doesn’t attempt to address, from the United Nations botching its peacekeeping mission in Rwanda to the raiding of resources disguised as rebuilding efforts. The series is adamant that the rabbit hole always runs deeper, that there’s always another, higher link in the chain of command. When Gen. Simon Nyamoya (Daniel Sapani), a former corporal in the Tutsi army that brought an end to the mass slaughter, is arrested for some decades-old infraction, it’s only a matter of time before that case ends up on Eve’s desk. Kate, who is ordinarily in line with her mother’s pursuits, is incredibly hurt that Eve would prosecute someone who is viewed by many as a hero, and who effectively saved Kate’s life by battling the Hutu forces. They fight, but it’s not long before Kate is shoulder-deep in official memos and faded photographs, investigating not just this crime but a handful of others. Black Earth Rising is made up of two, not-so-distinct halves—the first focuses on Nyamoya’s prosecution, but it also lays the groundwork for the overarching story of the back half. As Kate moves from one case to another, the show almost becomes a procedural, right down to the limited characterization. People’s jobs dictate most of their actions: Eve and her colleague Michael Ennis (John Goodman, who pairs a soft voice with a big jurisdiction) litigate; Rwandan politicians like Alice Munezero (Noma Dumezweni) make promises; a “Rottweiler” of a defense lawyer played by Blick himself shields his wealthy clientele from any blowback for their misdeeds. Even though they all get several monologues per episode, the dialogue communicates very little—their speeches are the equivalent of a raised eyebrow, announcing to everyone when something isn’t being said. And whenever a new player is introduced, like the enigmatic Florence Karamera (Emmanuel Imani), they’re given little interiority, but oh, how their eyes dart around to indicate something is about to happen. 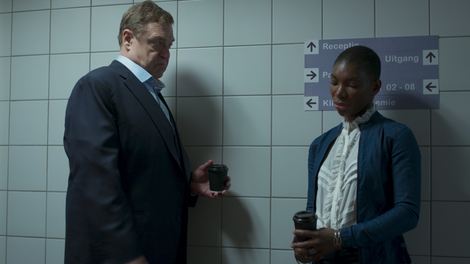 Black Earth Rising’s focus on moving outward, on widening the scope of the investigations and recriminations to put the whole system on trial, is admirable, but in so doing, the series loses sight of its lead character. The story starts and ends with Kate, but after eight hours, we still have little sense of how she’s coping with survivor’s guilt, mental illness, navigating two cultures, or any of the fallout from challenging rich white men who live on estates with driveways the size of football fields. Coel, who is an incredibly magnetic performer, does what she can with the material, which seems to consist solely of directions to “speechify” and “fly into a rage.” But those two modes, while helpful for driving the action and international travel, never allow Kate to reckon with what she learns about her past. Despite a talented cast and its creator’s ambitions, Black Earth Rising has limited insight into the lives of survivors.